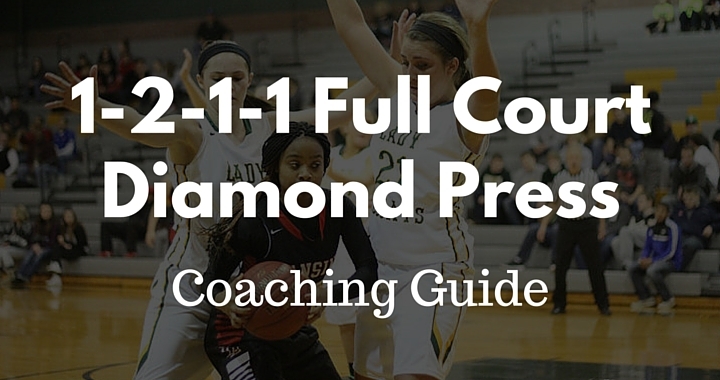 The 1-2-1-1 press is an aggressive full court press with many different variations that can be made to suit your team and/or to give you an advantage over the opponent you’re playing against. Similar starting formation to a 3-1-1 press, except that in the 1-2-1-1 press the front middle player starts close to the baseline pressuring the inbounder instead of starting around the free-throw line. The main goal of the press is to force the ball to be inbounded to the strong-side corner and then immediately trap the offensive player that catches the basketball using the inbounder and the closest wing player. This is the main trap of the press and the goal is to force the trapped offensive player to throw a lob pass over top of the trap and have it picked off by one of the defensive interceptors. While this is the main goal, there are many other opportunities for steals in other areas of the press. Since the main trap is being made so close to the oppositions baseline, if the press breaks down the defensive team will have the entire length of the court to recover and stop the basketball. If you’re running a full-court press you must be a team that loves playing fast basketball. Great half-court offensive teams hate presses because it forces them to play faster than they would like to. A full-court press is a great strategy to disrupt tempo. Let’s be honest… Everyone loves an uptempo, high-paced basketball game. The players love playing in it, the parents and fans love watching it, and we all love coaching it! If your team runs a full-court press they must be fit enough and have the stamina to do so. When you come up against opponents this aren’t used to the up-tempo style of play, they will undoubtedly get worn out very quickly and start making more and more mistakes. Instead of allowing a dominant guard to bring the ball up the court and set up the offense, running a full court press will force them to pass and use their teammates to bring the ball up the court. Once the ball is out of their hands, you have the opportunity to deny them receiving the basketball back. If your players are putting in 100% effort on every possession (they should be), then you will have to use more of the bench to keep everyone fresh. More court time for the bench often means a happier team. There’s no better time to get a steal than close to your opponents basket. Since the trap location is made in their corners, any steal will be incredibly difficult for the opposition to recover and defend. There can be consequences to running a high risk, high reward press like the 1-2-1-1 press. If the offensive team is to break the press, the defense will usually now find themselves with one less player until they front line catches up. 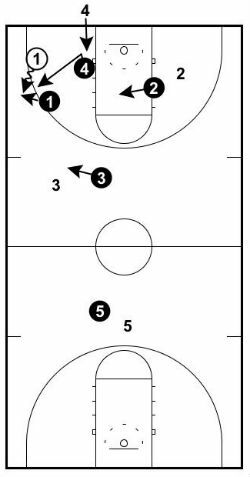 This can result in easy scores for the offensive team. If you’re running a full court press like this one, you must be able to handle giving away easy scores occasionally. The thing about presses is that they require the entire team to work together in sync. If a single player on the court doesn’t fulfil their require role, the entire press breaks down and gaps will open up everywhere. The 1-2-1-1 press is a fairly advanced full-court press. It’s not something your team will learn in a couple of practices. This means the time you devote in practice to learning the 1-2-1-1 presstakes away from the time your team could be learning and practicing other skills. This isn’t a trade all coaches are willing to make. The wing players on the front line must not allow the player receiving the basketball to beat them down the sideline. As soon as they do, the press is broken and it will often lead to an easy score. The 1-2-1-1 press is often broken as soon as the ball is passed to the middle of the floor. 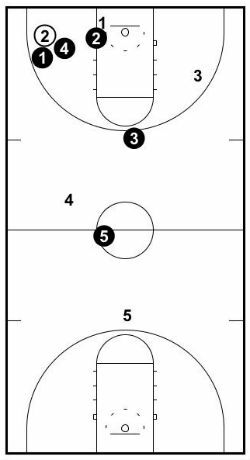 This is because from the middle of the floor the offensive team will have loose players sprinting down the sidelines while the front line is trying to recover. Be sure to remind your players that the steal shouldn’t be made by the players setting the trap. The objective of the trappers is to force the trapped player to make a lob pass that can be intercepted. The trappers must keep their arms out and use their lower body to take up space. As you can see in the diagram, the name ‘diamond press’ comes from its formation. If you were to get a birds-eye view of the press on the initial setup, you would see the first four players are set up very similar to a diamond shape while one fifth player is positioned at the back playing safety. Let’s discuss the roles and responsibilities of each position and then we’ll discuss how you should determine which players fill each position and which are the most important to the press. The disruptor starts on the basketball and should be one of the tallest players on your team. In a perfect world this player is tall, has long arms, and is athletic enough to quickly get to traps and recover. 2. Trap the first pass receiver with either wing player. 1. Stong-side wing player – Their role is to immediately trap the basketball with the disruptor on the inbounds pass. 2. 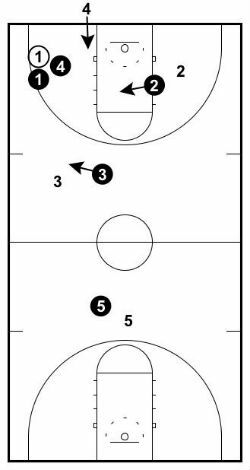 Weak-side wing player – Their role is to become an interceptor in the middle of the floor. 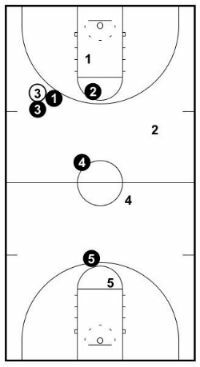 The weak-side wing player’s role is super important in the 1-2-1-1 press since this is the position where a lot of variation will occur and because they’re protecting and preventing the pass to a very important part of the floor… the middle of the press. These players will each start on their respective sides behind the closest player to the ball in their zone. 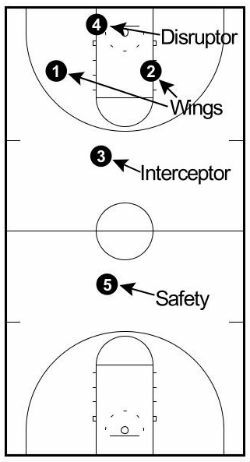 The interceptor’s main role is to anticipate where the pass will be made over the trap and intercept the basketball while in flight. They will also be required to stop the dribbler if they do break through the initial trap. If they can’t stop them completely, the interceptor must at least influence them to the sideline. Don’t allow them to blow past! This player must have a high basketball IQ! They will set up in line with the player inbouding the basketball, and about half way between the three-point line and half court. 1. They must anticipate and intercept long passes. 2. They must be great 2-on-1 defenders since they will find themselves in this situation often. They will set up as far back as the last offensive player. If the last player is at half way, set up there. If the last player is under the basket, set up at the distance you can cheat up the court while still being able to recover and intercept the lob pass. It’s easier to cheat up the court as safety in youth basketball since the players simply aren’t strong enough to make the full-court pass to an offensive player close to the basket. Although there will be substitutions so this will change often, here’s a quick guide for how I recommend you choose which players fill each positions in the 1-2-1-1 press. 1. Start by choosing the ‘interceptor’ – In my opinion, this is the most important position of the press. This player should be the best anticipator on your team and preferably athletic. I usually choose the point guard, shooting guard, or small forward for this position so that the bigs can fill the disruptor and safety roles. 2. Decide the positions of your bigs – One of your bigs will be the safety and one will be the disruptor. Allocate the more versatile and athletic big to be the disruptor. They will be required to cover much more of the court and sprint to traps or down the court non-stop. The slower big will be the safety. 3. The last two players will be wings – With the other 3 positions of the press filled, the last two player will each be allocated to a wing. These will usually be a combination of the point guard, shooting guard, and small forward. Your team may not have the personnel to perfectly fulfill the the requirements of each position I’ve explained above… and that’s okay. 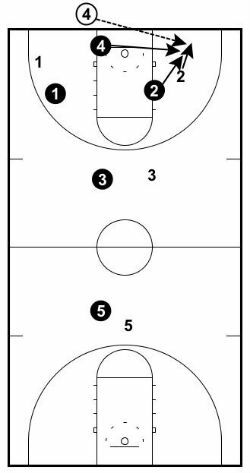 Tall teams can have success with this offense. Short teams can have success with this offense. The point guard may be the best option at your disposal to put all the way back at safety in the defense. At the end of the day, while I believe using the roles I’ve written above is the best way to have success with this defense, all positions are interchangeable depending on your personnel. 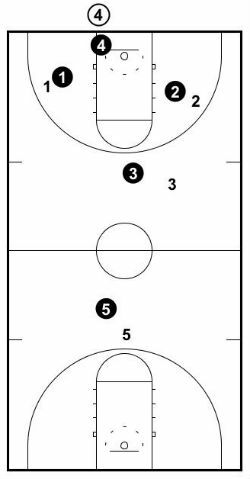 The very first thing you must understand about executing the 1-2-1-1 press is that our first goal is to get the offensive team to inbound the basketball to the corner. This starts with the disruptor (X4). Depending on where the offensive player takes the ball out of bounds on the baseline, the disruptor must position themselves so that it’s difficult for the inbounder to make a pass anywhere except the strong-side corner. While the strong-side corner is our preferred area for the opposition to inbound the basketball, they’ll often go out of their way to make a pass to the opposite side of the court in an attempt to disrupt our defense. We don’t mind a pass to the weak-side corner although it does result in X4 being required to turn and sprint a further distance which takes extra time. 1. No jumping – The goal of the disruptor is not to intercept the basketball on the inbound (although that would be nice). By jumping off the ground, when the pass is made to the corner it will take longer for the disruptor to react and sprint to the trap. 2. Count out the 5 seconds – By having your disruptor count out the 5 seconds it will put pressure on the referee to make the call and on the offensive player inbounding the basketball to pass the in quickly. The two wing players begin the press behind the closest offensive players to the ball on their side of the court. This encourages the pass to be made to the corners. The reason we force the opposition to catch the basketball in the corner limits the options they have to pass since the sideline and baseline become extra defenders. Further down the floor the main interceptor should try and be about in-line with the inbounder while reading their eyes in case they make a pass over the top. The safety should be as far back as the furthest offensive player making sure that there are no easy scores or passes over the top in transition. The only other thing to be aware of on the inbounds is the inbounder running the baseline. If they do, X4 must continue to deny the pass to the middle of the floor at all times. As the name suggest, this involves the disruptor immediately sprinting to trap the basketball with either wing player as soon as the basketball is passed inbounds. This advanced variation involves the disruptor staying and denying the pass back to the inbounder until the guard who received the pass inbounds puts the ball on the floor. When they’ve taken the first dribble, X4 sprints to set the trap. For this example I’ll assume you’re setting the trap immediately (fist). When the ball is passed in to the strong-side corner, X1 and X4 immediately trap the basketball. X1 must close the space without allowing the ball to be dribbled past them down the sideline. This requires them to close out under control and read the offensive player. X4 must close out to the trap with high hands so that the pass to the middle of the floor is prevented. If the offensive guard catches the ball with their back towards the press, X1 should close the space quickly and then the trap should be made before they turn to see the floor. If they catch the ball on the run, then X1 must give them space and corral them towards the middle of the floor so that they aren’t beaten down the sideline and X4 can catch up to trap. As you can see, X1 reading the defense is incredible important. The same trap occurs if the basketball is passed to the weak-side corner. The only difference is that X4 must turn and has a longer distance to run before the trap and the wing defenders switch roles. When the initial trap is made, the other defenders become 2 interceptors (X2 and X3) and a safety (X5). 1. X2 moves to the middle of the court and prevents the pass into the middle of press. 2. X3 is the interceptor of all lob passes over the press and should be inline with the trap. 3. X5 is equal with the furthest offensive player back to be safety and can also intercept any long passes that are thrown. The two players trapping the basketball should not reach in and try and steal the ball. Doing so will often lead to fouls and that will give the offense the opportunity to set the offense back up. Rather, the trappers should take up space with their lower body while keeping their arms extended and high for pass deflections, to prevent vision down the floor, and to force the high lob pass over the trap. If the initial trap is set correctly, the only open pass the offensive player will have out of the trap will be to the player that inbounded them the basketball that has stepped inside the court. This isn’t necessarily a bad thing since the inbounder is often a big player that struggles to dribble and advance the ball up the court. When this pass is made (assuming the guard doesn’t throw a lob pass that we can intercept) the first thing that must happen is for the weak-side wing player to stunt at the player with the ball to give X4 time to catch up, and then recover to denying the player behind them. When the reverse pass is made X4 must sprint and guard the ball one-on-one while everyone else goes into full court deny. 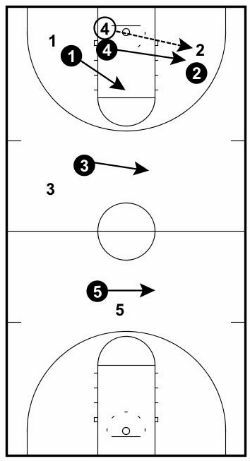 Doing so forces O4 to either advance the basketball by themselves or throw a tough pass. This is all while crucial seconds are ticking off the clock and we’re getting closer and closer to an 8 or 10 second violation. If the ball is reversed a second time to the opposite side of the floor we will trap again with X4 and X2. This requires the on-ball defender to not allow the offensive player to dribble down the sideline and for the disruptor to close out with high hands, again setting the trap and looking for the interception from the other players. 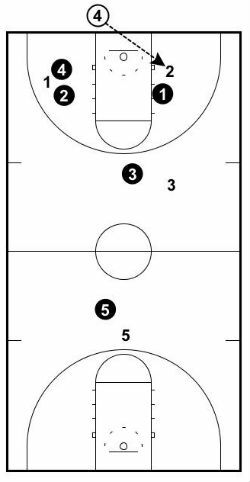 If the offense tries their luck at passing over top of the first defensive line then there should be an immediate trap by X3 and the wing player from whichever side of the court the ball is passed into. This is shown in the first diagram. Since the ball must travel through the air there is time for X3 to gain ground and get behind or at least close to the player receiving the basketball. 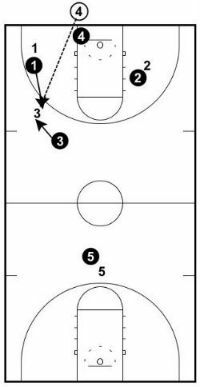 X3 must play directly in front the offensive player and not allow them to dribble down the sideline. We need to buy time for the wing defender to catch up and be able to set the trap with X3. The weak-side wing player and the disruptor must sprint back hard and must get into position to intercept the next pass. Where the offensive players scatter to will vary greatly on this pass over the top so it’s up to the two interceptors to be smart and play the passing lanes. If there’s a potential steal situation, we allow X5 to come up and try to intercept the next pass down the line but that requires X4 or X2 to sprint back and get to safety. When is the Press Over? As a general overall rule, stick with the press until the basketball has been passed into the middle of the press or the ball has crossed over the half-way line. If the ball gets passed into the middle, the closest player must get in front and slow the ball down while their teammates sprint back. And I really mean sprint. The transition from the press being broken to the half court defense your team is playing must be done as quick as possible. In fact, my number 1 rule of any full-court press is ‘players must sprint back when it’s broken or beaten!‘. While sprinting back, players should attempt to back-tap the basketball from behind to one of their teammates. This is a common way to make the 1-2-1-1 press super aggressive. If the opposition get smart and start inbounding the ball with a guard, then you must make a change to the defense. We don’t want one of our bigs guarding one of their guards full court, do we? The variation is for the weak-side wing player to deny the pass back to the inbounder on the trap instead of denying the pass to the middle of the floor. When running this variation, we have two trappers (X1 and X4), a deny player (X2), and two interceptors (X3 and X5). 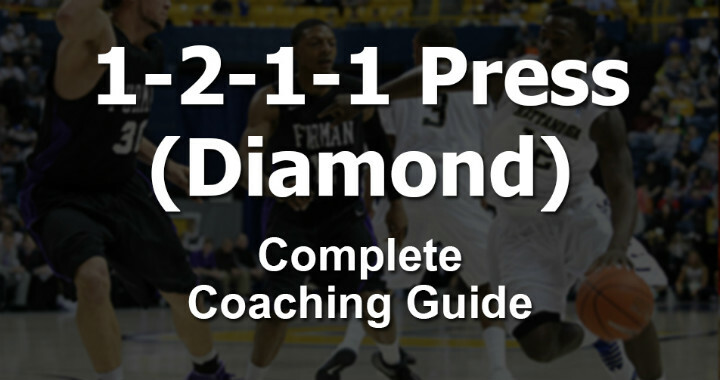 This is a more aggressive version of the diamond press since it forces the offense to make a forward pass. While at a disadvantage, X3 and X5 must anticipate and intercept the basketball from the other 3 players. 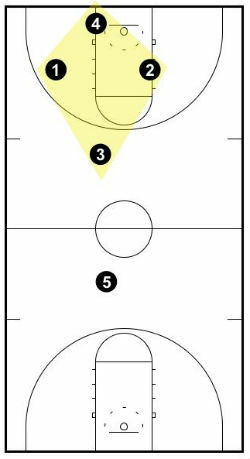 This variation makes it harder on both the offense and defense but can also lead to easier steals and scoring opportunities. I recommend calling this variation red, and calling the traditional method (not denying the pass to the inbounder) green so that your players can differentiate during the game without the opposition knowing what you’re running. 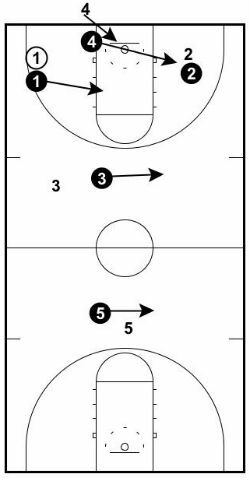 This can be a very effective variation in youth basketball because it takes advantage of the passers lack of strength to throw the full court pass to 5 and allows both interceptors to play up the court. The full court denial variation can be used when you need an immediate steal or simply to give the opposition a different look. The principles of the full court press stay the same. X4 starts on the basketball still forcing to the corner as that’s a smaller area and we’d prefer to know where the ball is most likely going to be passed to. X1 and X2 are in full frontal denial. We want the offense to be forced to make a tough pass that the wings have the chance to steal or a lob pass over the top that our interceptor or safety have a chance of stealing. X3 and X5 play the same as the traditional 1-2-1-1 press. They’re close enough to their players that they both can pick off any lob pass that is made to them, yet are still in position to make the inbounder hesitate to throw a lob pass to either wing player. You’ll often match up against opponents that have one dominant guard on their team. When this happens, you have the option of denying them the basketball using two players and forcing another player on their team to make a decision and run the offense. Instead of the two wing players zoning up and taking whomever is in their zone, they match up with the two offensive guards. This allows you to decide which wing player will defend the dominant guard. The interceptor and safety stay the same. So the formation will usually be relatively the same. In the diagram the player being denied is O1. The big difference is that X4 will face-guard the dominant guard, and with X4 and X2 both denying them the ball, the guard should have no chance of receiving the basketball. Just as in the traditional press, X1 will allow the weaker guard to receive the inbounds pass. When this is made, X4 leaves the dominant guard to come and double team the weaker guard wherever he is on the floor. X2’s role is now to deny the pass back to the dominant guard wile X3 and X5 become the interceptors. Even if the ball does end up back in the dominant guards hands, this variation will always waste valuable seconds off the shot clock and often pressure the offensive team to avoid the 8 or 10 second violation. The aggressiveness of the 1-2-1-1 press puts the opposition under immense pressure immediately. 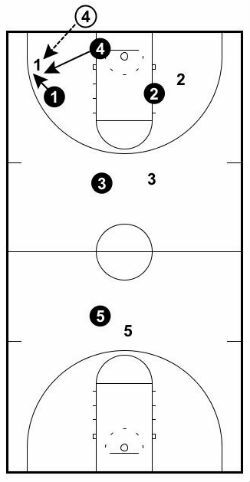 This is a great press to run if you want to play fast and make the offense uncomfortable. I recommend this press because of the number of variations. This allows you to adjust it to suit your team and make small variations each game depending on the opposition’s personnel. If you’ve got a team that wants to play aggressively and is willing to hustle, this can be a great press to implement for your team.